Use this multiple page list of free dollhouse plans and plan sources to find instructions to build a dollhouse or other miniature building or barn/stable for yourself or as a gift. The list includes full instructions for building an easy dolls house, and links to known sources of a variety of free and purchased traditional front or back opening doll house plans in scales from 1:6 (for fashion dolls), 1:12 (traditional dolls house scale and 1:24 or G scale for Garden ​Railroads. Dolls houses can be designed open, for children's play, partially open for viewing, or with opening front doors to protect the contents. These free plans for a Dollhouse or Baby House Case made from a single five-foot square sheet of Baltic Birch Plywood can be made with shelves to hold roomboxes for separate rooms, or divided into sections for a standard dollhouse. If interests change it can be used to hold books or other treasures. Fitted with front opening doors cut from the same sheet of plywood, that have dolls house windows and a door, the baby house has the appearance of a dolls house but has adjustable shelves to allow it to be adapted to hold books or other items as need change. Instructions for adding quoin trim and a cornice to finish the house off in a traditional style are also available. There are also instructions for building custom doors and windows. If you prefer, you can build the case and add fixed shelves and partitions to make a dedicated dollhouse. Roomboxes are easy to make and can be made to custom sizes for school projects or displays. This project uses book board, or Davey board, a dense paper fiberboard used for bookbinding, or illustration board. You can also build roomboxes from baltic birch plywood (see list item following). If you make several boxes the same height, in a depth that will fit on a bookcase, you can build a miniature display room by room. This simple roombox is made from sturdy, lightweight Baltic Birch Plywood. It can be custom sized to suit any scale of doll, including playscale fashion dolls. The boxes can be wired for lighting and given doors and windows. If you wish, the roombox can be given a custom frame, or you can size the box to fit a ready-made picture frame from an art supplier, as was done here. Like the bookboard roomboxes, if you make several boxes the same height, in a depth that will fit on a bookcase, you can build a miniature display room by room. A series of roomboxes can also be glued together to make a simple but sturdy dollhouse for a child. (The walls will be much thicker than those in a standard dolls house. After you've made your choice of plan or kit, check out the Tips for Finishing a Dolls' House to help plan your project workflow. Some steps or finishes are easier to fit into your house before assembly. Fine scroll saw has some vintage hobbies design sheets for dollhouse building patterns which are free to download. You will need to set a scale for these patterns. Mother Earth News has free plans (see the gallery of photos) and instructions for building a 1:12 scale farmhouse. Open dollhouse design plans suitable for younger children are available from Woodstore. Frank Martin sells Barbie Scale Dollhouse kits, plans, and furniture. Forest Street Designs have plans for a portable folding house for Barbie complete with furniture. U bild have 11½ inch dollhouse plans and other dollhouse scale plans. Houseworks sell 1:6 (playscale) building components available through many hobby shops. Dollhouse Designs have plans in 1:12 scale for several traditional dollhouses which can be downloaded. J.E. Cavender Plans are available from Dollhouse Miniatures. 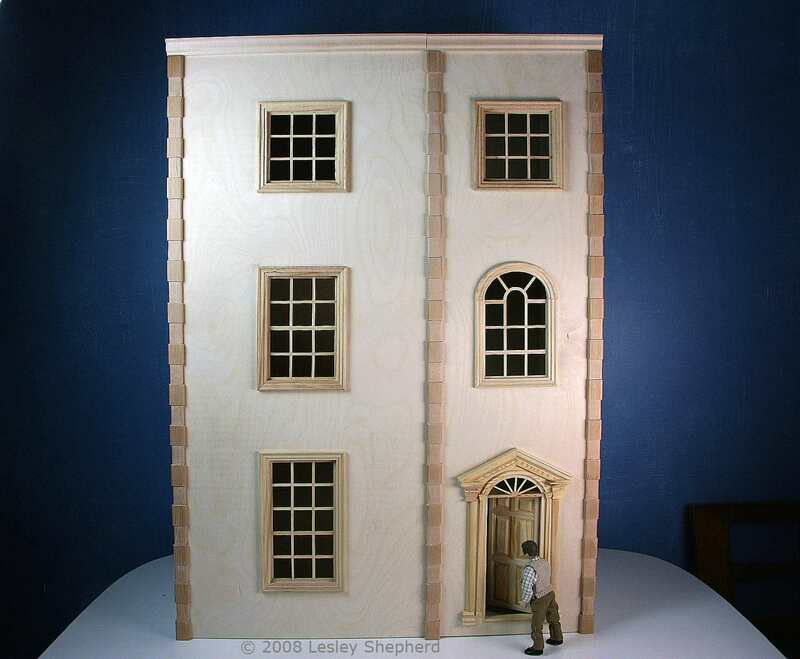 The Hobbies Company in England sells a range of traditional dollhouse and shop plans in 1:12 scale. Dijon sells traditional English dollhouse plans which are also distributed in North America by several companies. The Woodcrafter produce dollhouse plans in 1:12 scale. Forest Street Designs have plans for a lovely Bavarian cottage and furniture in 1:12 scale. Hobbies sell 1:24 scale dollhouse plans. Dijon sells tradition 1:24 scale plans. Garden Texture have some building plans as well as materials for building in G scale. Ozark Miniatures have G scale drawings for a number of their buildings as well as plastic finishing materials in scales from 1:12 to 1:84. Brewer Railroad Plans have G scale building plans. Jig Stones, sell plans and G scale molds for casting stones and parts to construct G scale buildings You can see tips ​from a railroad modeler who has used them. Sidestreet Bannerworks have G scale plans for garden railway buildings. Stoneworks sell G scale plans for stone buildings including water mills. Plans to build a model Iroquois Longhouse in 1:4 scale (not 1:48!) from the New York State Museum. Forest Street Designs have some Italian bird houses and bird cages that can be adapted for dolls house designs. They also have plans for a traditional farm and fort, toys and several houses. Houseworks (available via craft and miniature stores) produces a line of plan books in 1:12 scale (which could easily be downsized to 1:24 scale) Tuxedo Place, Les Shoppes, Townsend Towers and 3 in One, are all books for 1:12 scale houses and shops. Houseworks also produce a similar line of Playscale (fashion doll scale) plan books in Country House, Townhouse and Estate House designs. The Doll's House Shopkeeper by Lionel and Ann Barnard, David and Charles 2001, includes plans for five traditions shop plans in 1:12 scale. Making Dolls' Houses in 1:12 Scale by Brian Nickolls includes instructions for building five very different dolls houses, from a Victorian Shop to a Fisherman's Cottage. Making Character Dolls' Houses in 1:12 Scale by Brian Nickolls includes a thatched cider barn, thatched forge, watermill, pub, and Georgian mansion. Le Grande Livre De La Maison Miniature by Cristine Lea Frisoni is a wonderful book written in French which gives building and furnishing details for a French Chateau or Shop. Binky's Woodworking has plans for a barn and fencing for Breyer Horses. These plans for a simple stable box (shown in photo) plans can be adapted to fit a range of model horse sizes and can be made from plywood or bookboard (illustration or Davy Board) depending on the use.